in E-flat major, K.370b + 371. A Facsimile Reconstruction of the Autograph Sources. With a Foreword by John Brooks Howard and Introductory Essays by Christoph Wolff and Robert D. Levin. Issued on the Occasion of the 85th Birthday (May 2, 1997) of Dr. Eric Offenbacher. Cambridge: Harvard College Library, 1997. Oblong 4˚, 66 pp. (36 color facs), clothbound. OMI is the sole distributor of the facsimile edition Mozart: Horn Concerto K. 370b + 371 by the Harvard College Music Library. This fascinating work, possibly commissioned for the Viennese hornist Jacob Eisen, is one of a number of incomplete concerti left by Mozart and one that suffered an unfortunate circumstance. In 1856, for the centennial of Mozart's birth, the composer's eldest son, Carl, decided to cut up and give away portions of the autograph (first movement) as souvenirs to several admirers of his father's music. Now, more than a 140 years after Carl's strange celebration, eight of a total of nine fragments are preserved in seven libraries, six in Europe and one in the US. This facsimile commemorates not only the establishment at Harvard University of the Biblioteca Mozartiana Eric Offenbacher (BMEO) but two important reunifications of the concerto's parts. 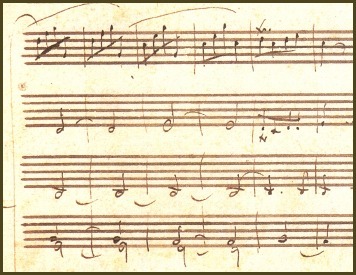 The first one, assembles and reproduces the scattered autograph fragments of the first movement (K.370b) noted above. The collection of Dr. Offenbacher, donated by him to Harvard, has among its treasures one of these fragments. He had always considered the possibility of bringing them together for an exhibition. This publication has realized that wish by presenting all the surviving fragments which form a substantial portion of the first movement, including an uninterrupted draft score of its first 131 measures. For the second reunification we have to be thankful to Mr. Robert Owen Lehman who has made it possible to present the autograph score of the second movement (K.371) in its entirety. This movement entitled "Rondeau" by Mozart was, until recently, known in a misleading incomplete form and performed in a mutilated version for over half a century. The MS lacked a bifolio that reappeared in 1988. Mr. Lehman, who owns K.371, acquired this bifolio, miraculously completing, after nearly two centuries, this score. 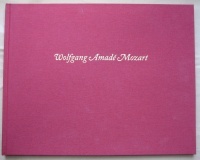 These extraordinary events make this publication an invaluable contribution to Mozart studies and highlight one the prime purposes and advantages of the facsimile edition: to have at one's disposal, and side by side, primary sources located thousands of miles apart.